The satellite animation above shows a very large, sprawled out tropical storm affecting the Lesser Antilles this evening. There is some dry air to the north which is acting to suppress the organization of the cyclone. This dry air is slowly getting mixed out and should become less of a factor heading into Thursday. Outflow (cirrus moving anti-cyclonically away from the storm) is well established to the west, south, and decent on the east. There is a lack of established outflow to the north. . .evidence of the dry air and modest shear (~ 20 knots) to the north of Isaac. 12z 08/22/12 track guidance for Isaac. The track guidance from the morning model runs shows a clustering of tracks over Hispaniola (Haiti and Dominican Republic) with an eventual tango with eastern Cuba and south Florida. One model, the European Center model (ECMWF), which usually performs well, is taking Isaac in a weaker state towards the Gulf of Mexico, then shows explosive deepening. 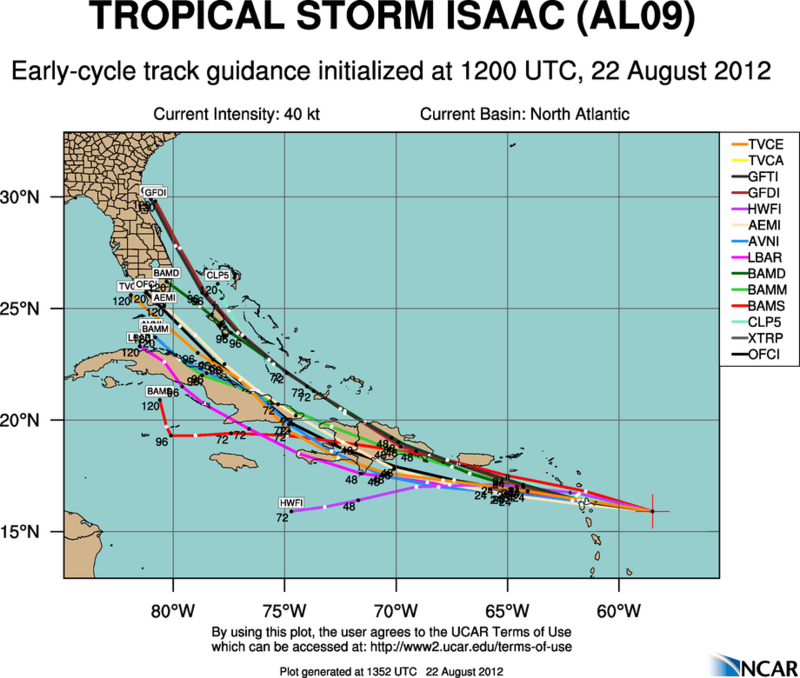 The track guidance above would suggest a low end hurricane or tropical storm affecting Hispaniola, Cuba, and Florida. On the other extreme. . .the Canadian model has been showing a jump to the north of Hispaniola, then a track towards eastern South Carolina or North Carolina. If that track verified, then we could be talking a significant hurricane affecting the U.S. East Coast. 18z GFS sea-level pressure and 6 hour accumulated precipitation valid at 2 pm EDT on Monday, 08/27/12. The 18z GFS forecast for next Monday at 2 pm EDT shows Isaac in some form just west of Ft. Myers, Florida. I would put this track as middle of the road and in-line with the NHC official forecast. Technically, this is the best case scenario for the U.S. as the storm would spend much time over the mountainous terrain of Hispaniola and eastern Cuba where some mountains eclipse 12,000 ft. That would not destroy the storm, but would certainly disrupt it. I think Isaac would be a strong Tropical Storm (winds of 65-70 mph) near Florida if this track were to verify. Now, the extreme cases should not be discounted. If the storm goes farther west and into the Gulf, we could be talking a very strong hurricane as the European model suggests. If the storm makes it’s way east of Florida and into the Carolinas, we would be talking a Cat 2 or Cat 3 hurricane at landfall. The only part of this I am feeling confident about is that a storm will make landfall in the U.S. next week. I know people want a better answer than this, but when storms are in their organizing state, they are difficult to forecast. I will update this post tomorrow with more information. Previous Post Hurricane Gordon. . .IV?